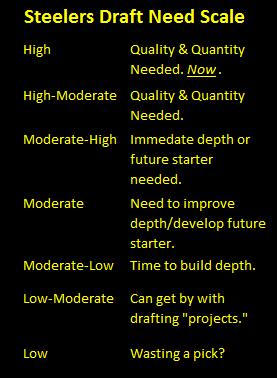 The 2015 NFL Draft approaches, and so it’s time to take stock of the Pittsburgh Steelers 2015 Draft needs. As always, Steel Curtain Rising will inventory the Steelers entire roster, from top to bottom with an eye towards identifying the areas where the Steelers need find the most help from the draft. There’s a 50/50 chance the Kevin Colbert will go on the record saying that quarterback is an option for the Pittsburgh Steelers in the first round of the 2015 NFL Draft. Yeah, and there’s also a chance Art Rooney II will fire Mike Tomlin and replace him with Buddy Ryan before opening day. 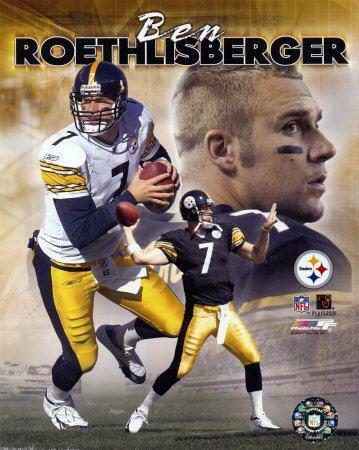 With Ben Roethlisberger, the Steelers are set at quarterback. The franchise knows this, with Dan Rooney admitting in his self-titled autobiography that the ghost of not drafting Dan Marino hung over him while the Steelers debated their pick in 2004. Behind Ben Roethlisberger, the Steelers have Bruce Gradkowski a Pittsburgh native who has logged action in 40 regular season games and boasts 20 starts. At this point in his career, Gradkowksi has settled into his role as a career backup, and in many ways fits the mold of the man he replaced, Charlie Batch. The Steelers are one of the few remaining teams that believe in and invests in putting a veteran back up behind the established starter. And while Gradkowski hasn’t seen much work in the regular season (and God willing he won’t), he came in during the Steelers playoff loss to Baltimore and the Steelers offense didn’t miss a beat. The Steelers are set for another year at least with Gradkowski as their back up. But the same cannot be said for Landry Jones. The Steelers decision to pick Jones in the 4th round of the 2013 NFL Draft surprised some, with some commentators even arguing that the pick was intended to groom a replacement for Roethlisberger. Two years later those predictions look foolish. The bigger question is why have the Steelers kept him on the active roster. Clearly the coaches see something, but numbers don’t lie. Look back to Brian St. Pierre’s second preseason, and you’ll see that his numbers are better than those that Landry Jones put up. The Steelers recently signed Tajh Boyd, which shows that the Steelers are ready to window shop for a young arm to develop. While an upgrade at the third quarterback slot would be welcome, given the Steelers overall roster this can hardly be considered a priority, and drafting a quarterback anywhere above round 5 would amount to a questionable use of a pick. Don’t expect the Steelers to do so. A new third string quarterback would be nice, and can be found in the draft, but the priority simply isn’t high. Low-moderate. This entry was posted in Steelers 2015 off season, Steelers Draft and tagged 2015 NFL Draft, Art Rooney II, Bruce Gradkowski, Charlie Batch, Kevin Colbert, Landry Jones, Mike Tomlin, Pittsburgh Steelers. Bookmark the permalink. Vick will prove to everyone on Thursday night why he wasn’ on a roster when the steelers signed him. Art Rooney must be ashamed of this team. First thanks to both John and Earl for taking time out to comment. On paper, it says here that signing Michael Vick was the smart move when Bruce Gradkowski went down. But now is indeed the time for Vick to prove himself.